The popular five volume folio Birds of Great Britain was originally issued in London in twenty-five parts between 1863 and 1873. It contains 367 coloured lithographs. 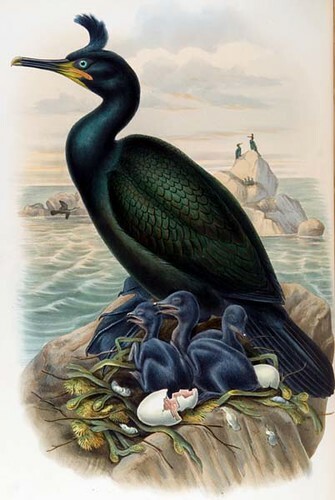 John Gould has been called the greatest figure in bird illustration after Audubon. Gould was not directly responsible for the illustrations himself, although he supervised their production closely. His talent lay in drawing rough sketches, having an uncanny eye for capturing the characteristics and differences of each species. A keen observer, he had an extraordinary faculty for quickly recording in a rough sketch the characteristics of any bird that he saw. It was from these sketches that his artists made the beautiful finished drawings; these were then redrawn on stone to create the lithographs which were each finished by being hand coloured. Gould searched high and low for subjects for this work on British birds. The vast majority of the plates were sketched from freshly killed specimens; drawings were then made at a later date to be redrawn on stone by William Hart.